In Miyazaki’s films, seriousness is paired with a lack of stridency. Environmental concerns are central to the plot in Nausicaa and Princess Mononoke (they are also the heart of Castle In The Sky and My Neighbor Totoro), but never do his films turn into Ferngully: The Last Rainforest. These are stories first and foremost, and Miyazaki stays focused on that. 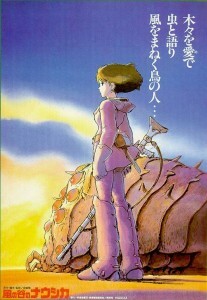 Nausicaa is the beloved princess of the Valley of the Wind. Besides being a skilled warrior and a kind leader, she’s entomologically curious. She wants to know the secret of the Sea of Decay, a buggy forest full of poisonous spores. Insects rule here, and humanity has few and distant shores. Of course, the few people left still find time to squabble and war with each other. A prologue tells us that “giant warriors” scorched the earth and brought about the Sea of Decay. Now their skeletal husks1 dot the land – but one of these creatures is still alive, and the Imperialist Tolmekians have stolen it. The plane with the warrior egg crashes into the Valley of the Wind, causing international strife. All of this fighting is futile and empty. The Sea of Decay devoured the countries for which these people fight, and, save for the noble Nausicaa, we have no one to sympathize with. One country steals the giant warrior, the country they stole it from shoots down their planes. Their goals, to defeat each other, are separate from the greater aim of survival. Miyazaki’s world is one in which man is no longer top dog. We’ve left the top of the food chain, and the same turf struggles and political debates we’ve had for millennia serve nothing but our own destruction. As is common for semi-Marxist utopic fiction, no real alternative beyond criticism is espoused (which is probably just as well, since films should entertain, not teach). 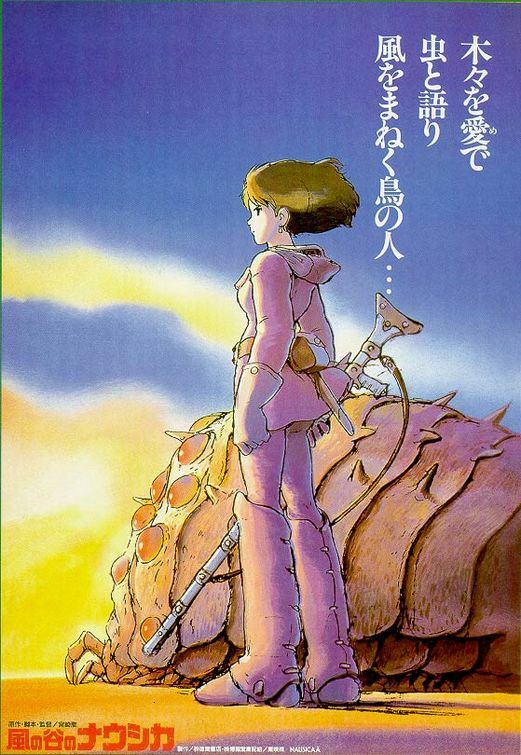 There are parallels between Miyazaki’s world and that of Frank Herbert’s Dune. Missing is the religious depth of Herbert’s world (due to Miyazaki’s hostility towards religion). But the main trappings of an inhospitable world — with a strong race of warriors ruled by giant worms whose terror hides their real beneficence — are the same. The resolution is not. In Dune, man conquers the environment. In Nausicaa, man adapts to it. He’s thrown into a situation for which his evolutionary might is futile. For all its portentousness, Nausicaa is not dull, nor is it dour. The Sea of Decay is rendered lovingly, much like the overgrown forests of Disney’s Alice In Wonderland. The movement of insects, not to mention their society, is detailed greatly. And the skeletons of the giant warriors are beautiful, in a sad, haunting way. Conrad’s View – Berlin Alexanderplatz – II. How is One to Live if One Doesn’t Want to Die?